Every religion, every culture, and every nation has its origin story. Origin stories tell us who we are, where we come from, how we got here, and how we should live with one another. They give us a common understanding of our place in this beautiful but sometimes frightening world. The problem is traditional origin stories, especially religious ones, no longer reflect today’s modern, globalized world. They’re just myths and fables that few people believe anymore. The fundamental idea of Origin Story is that history is all about the development of complexity in the Universe. It’s a story that spans 13.8 billion years from the Big Bang right up to today. Christian arranges his origin story around a few pivotal events that he calls thresholds. Each threshold is a milestone that marks the creation or emergence of a new, increased level of complexity in the Universe. Christian identifies eight of these threshold moments when the correct conditions – “Goldilocks conditions” – gave rise to something new and more complex. The bulk of the book tells the story of these thresholds. Let’s take a quick tour. Threshold 1: The Big Bang. In the beginning … all the matter and energy of our Universe was contained in a single point smaller than an atom. It exploded 13.8 billion years ago, kick-starting the Universe with an enormous, unimaginable blast of energy. Electrons, neutrons and protons emerged within seconds. About 380,000 years later the first atoms, hydrogen and helium, congealed out of the rapidly expanding cloud of matter let loose by the Big Bang. Threshold 2: The stars light up. The thin fog of hydrogen and helium atoms created by the Big Bang began to form clumps as gravity drew neighboring atoms towards each other. Eventually gravity made these clumps so dense and so hot that some hydrogen atoms began to fuse together into helium which in turn released more energy and more heat. At about 10 million degrees, hydrogen fusion becomes a self-sustaining chain reaction. A mere 600 million years after the Big Bang, a star is born. And not just one star; billions, and trillions of them. Under the guiding hand of gravity they grouped together to form the complex structures we know as galaxies. Threshold 3: The elements. As stars age and die, the gravitational forces at their cores recreate the ultra-high temperatures and pressures that existed only in the first moments after the Big Bang. Hydrogen and helium start to fuse into larger, more complex elements like carbon, oxygen and iron. When dying stars finally explode in novae and supernovas, they spread their exotic contents into the universe, seeding it with the potential for even more complex structures, like planets and people. The solar system, our Earth, and all of life only became possible when stars began to die. Threshold 4: Our solar system. In the same way that hydrogen and helium atoms clumped together to form stars, larger atoms began to assemble into more complex chemicals. They formed molecules, including water and silica, essential for the creation of rocks, asteroids and planets, and they formed amino acids, essential for the emergence of life. Our solar system formed this way about 4.5 billion years ago. Threshold 6: Humans. Homo sapiens emerged as a distinct primate species in Africa somewhere between 200,000 and 300,000 years ago. Today, there are more than 7 billion of us. We don’t just dominate every other species on the planet, we have the power to shape and even destroy Earth’s entire biosphere. What gave Homo sapiens such a decisive advantage? Christian argues that it was language that set us apart. Threshold 7: Farming. Early humans were nomadic or semi-nomadic hunters and gatherers. Collective learning helped them to increase their population, but ultimately it reached a limit, bounded by the amount of energy humans could forage from the land around them. Then about 10,000 years ago, at the end of the last ice age and the beginning of the current geological epoch known as the Holocene, humans began farming. Farming is such a difficult and chancy business that it’s quite possible we took to it reluctantly. But it created what Christian calls an “energy bonanza” that enabled humans to support a huge increase in population. Here’s where collective learning really paid off. When humans reached a plateau on the population growth curve, they had an option not available to any other species on the planet: they could innovate. Using knowledge, collectively accumulated and passed from one generation to the next through language, Homo sapiens were able to escape population restrictions imposed by the limited amounts of energy that could be gained from foraging. In other words, humans innovated their way out of an energy crisis. Threshold 8: The Anthropocene. About 200 years ago with the discovery of fossil fuels, first coal and then oil, humans unleashed another energy bonanza, ushered in the industrial era and crossed the eighth and final threshold. We are now living in what some geologists call the “Anthropocene”, the human epoch. Christian ends Origin Story with a question: can humans transition to a more sustainable world in which we deliberately and carefully manage Earth’s entire biosphere. In other words, can we cross Threshold 9? Prof. Christian’s modern origin story really is as meaningful and awe-inspiring and mysterious as any traditional one. The fact that it’s not complete, that there are still gaps in our knowledge, makes it even more compelling and more believable for me. A story spanning 13.8 billion years that had no gaps and no inconsistencies would seem far too perfect to be credible. More important, there’s room for the story to improve and grow over time. It invites inquiry rather than demanding faith. It’s an origin story that has no creator god. It doesn’t need one. I wholeheartedly agree. If humanity is to unite in the shared task of taking care of our Earth, then we must set aside many of our differences including religious differences. It doesn’t matter whether you believe in one god or many gods or zero gods, the Earth is warming, the seas are rising and we must act together. A global origin story built on our accumulated scientific knowledge is a great place to start. Gods just divide us. One possible criticism of the book is that ethics and morality are largely absent from this origin story. Christian alludes to the agency in all living organisms as the basis for ethics and morality but he just touches on the subject and then moves on. I think this is deliberate. Origin Story covers 13.8 billion years of history. That’s enough for one book. A consistent theme running through the whole book, and across all the thresholds, is emergence, the idea of new things with new properties and new levels of complexity arising from the evolution of existing things. I really love this idea. It tells us that evolution, growth and novelty are embedded in the fabric of the universe. Christian tells his origin story beautifully. He explains scientific ideas from many disciplines clearly and without over-simplifying. Yet the book isn’t just dry technical detail. It’s compelling, even exciting in places. The thresholds form a great organizing framework. Throughout the book, he does a wonderful job giving you a sense of just how enormous the universe is, how long it’s been in existence, how much energy and matter it contains, and how sudden and recent and precarious human history really is. It’s breathtaking. Finally, I get the sense that Prof. Christian is fairly pessimistic about our chances of crossing Threshold 9 to a more sustainable world. He’s right to be concerned, and right to sound the alarm. There’s no question the challenge we face now is greater and more urgent than anything we’ve dealt with before. But his own book tells us that we humans have repeatedly innovated our way out of crises, and that we, alone of all the species on the planet, are capable of doing this. That gives me hope. 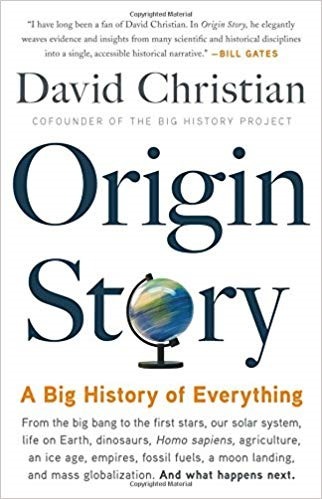 Origin Story is based on a course Prof. Christian taught at Macquarie University and later turned into a web site called The Big History Project. It’s available for anyone to study online. This entry was posted in Books, Environment and tagged Big Bang, book review, book reviews, books, climate change, complexity, creation, David Christian, Environment, Origin Story, science. Bookmark the permalink.